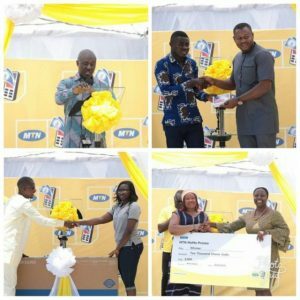 The First batch of the MTN Mobile Money promo winners have received cash prizes, iPhone X, Samsung S9+, Samsung TV sets for earning higher points on their wallets. The ultimate winner took home iPhone X, the second winner received Samsung S9+ whiles the third winner carried home a 49 inch Samsung tv set. Others took home Ghc 2000, Ghc1000 and Ghc 500 cash prizes. Speaking at the ceremony, the General Manager of Mobile Financial Services, MTN, Mr. Eli Hini said the first presentation is a reward for those who emerged winners for the month of August. He indicated that rewards remain a good way to encourage loyalty and drive participation. 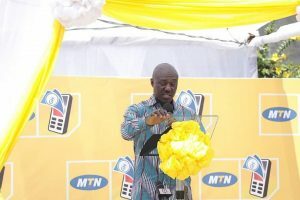 “This is one of the reasons why MTN comes up with exciting promos during the MoMo Month to drive the broader national agenda of a cashlite economy,” Mr. Hini stated. He noted that 250 customers will be rewarded with various prizes including iPhone X, Samsung s9+, Samsung TV sets, e-cash and many more. Mr. Eli Hini added that over the next two months, more than 500 MTN Ghana customers will be rewarded for participating in the MoMo Month promo. According to him, the promo, which will run for three months is a transaction driven and points based which started on 1st August. Mr. Hini stressed that MTN Ghana organised the MoMo Month to drive awareness about the importance of the digital payments while exciting customers with promos and rewards. He intimated that many more Ghanaians will also have the opportunity to know about and register to be on Ghana’s most secure payment platform MTN MoMo. According to him, digital financial services are increasingly playing a central role in our efforts at ensuring financial inclusion across all sectors – be it formal or informal. “MTN Ghana is therefore committed to leading in the delivery of a bold new digital world by churning out innovative products and services. Today, we proudly boast of the many partnerships that is driving digital payments, from NFC payments at shopping centers, bill and salary payments, micro-insurance and peer to peer payments,” he emphasized.